Aston Shaw, the fastest growing accountancy firm in East Anglia, has appointed two new Directors, in order to create a long-term structure that addresses the firm’s ongoing expansion. Aston Shaw’s current Directors, Mark Noakes and Dominic Shaw, are keen to promote senior positions from within and long-serving Client Managers Lee Stratton, 28 and Adam Hook, 34 will take a Directorship role within the business as of August 2015. The ethos at Aston Shaw has always been to accelerate the growth and experience of younger employees, going against the accepted industry trend and this is now being reflected from the top down. 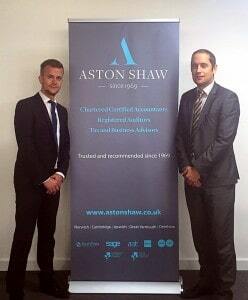 Lee Stratton and Adam Hook joined Aston Shaw in 2005 and 2006 respectively and both qualified as Chartered Certified accountants in 2011. They both manage their own varied portfolio of clients, with Lee specialising in the construction industry and Adam the agricultural sector. Both Directors will retain their current portfolio and will continue to have day to day interaction with their clients, alongside their new responsibilities. Aston Shaw has gone from strength to strength since the merger with Morgan Woods in 2014, and recent takeover of Roger Hopkins in 2015. Since 2014 the company’s staff numbers have grown by nearly 50% and the number of clients has also grown by upwards of 20%.